Interesting Needlework Site… And a Question! Hooked on Needles is a site dedicated to knitting and crochet. The name – which may conjure up images that aren’t quite related to homey arts – implies that there’s more to it than just crochet and knitting, though, as needles are used in — well, seems obvious to say — other kinds of needlework, too. And in scrolling through the site, I did see some samples of embroidery (on an Irish dancing dress) and a crocheted lace collar. But what really hooked me (SORRY! I couldn’t help it!) 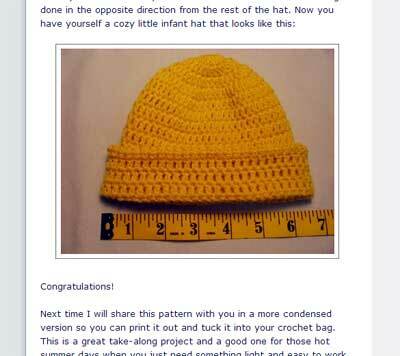 are the photo tutorials on the baby’s crocheted hat (looks very simple – like I might even accomplish it!) and changing color in crochet. Back in the day, for a needleworker to be considered “trained” (and I think the same holds true, actually, today in some professional courses! ), they had to know the basics of more than just the kind of needlework they were passionate about. To be a well-rounded textile artist, being familiar with other elements of the textile world is a good thing. I don’t claim to be a “textile artist” – embroidery is my hobby – but I do like the idea of a well-rounded education. I bet that even the best painters who work in oil have at least an understanding of how water-colors work, don’t you think? So I started looking into polishing up my crocheting, with the end in mind of doing some tiny crocheted trim for an embroidered piece. And then I landed at this particular website and liked, especially, the hat tutorial and the one on changing colors. I started thinking that you could put the two tutorials together, and make a Really Cute and Colorful baby hat! Don’t get me wrong, though! I’m not going to yarn! My needle ‘n thread will continue to be occupied (obsessed, even) with embroidery! But what do YOU think? Do you think it’s useful for the embroiderer to be at least somewhat aware of other needlework techniques, such as knitting and crochet? Or do you think that, for embroiderers to become Really Good at what they do, they should focus solely on embroidery and not get distracted by other possible needlework interests? I’d love to hear your thoughts on that! Your point about painters is correct. An understanding of other techniques is good knowledge to have. You don’t have to “do” the other techniques all the time. My grandmother taught me how to do many types of handwork: crocheting, needlepoint, embroidery, beadwork, cross stitch, quilting and sewing clothes. Over the years my focus has moved from technique to technique. Without the basic instructions from my grandmother, I probably would have never enjoyed so many hobbies. Now I focus on quilting and stitcheries for my quilting projects. I find myself often referring to other techniques I learned when I am working on projects now. Very good question, Mary! At one point (well, the personal opinion still stands, really) I considered myself a dilettante – dabbling in all kinds of needlework and not excelling in any one technique. “At one point” I felt that was a negative thing. I have finally come to the conclusion that all that dabbling has made me a better-rounded, educated and accomplished needleworker. I am more qualified to appreciate the work that has gone into a piece and I am able to draw inspiration from the various techniques. All the dabbling has also increased my confidence in my own creative endeavors. A perfect example is my dancer daughter. She loves Swing and various other partner dancing. However, as a dance major at university she has been forced to study ballet as well as modern dance. Now when she goes out to partner dance, even though partner dancing takes a back seat during the academic year, she consistently gets compliments on her dancing – her balance, her connections, her all around skill. Being exposed to and learning other complementary techniques makes one more proficient in their favorite technique. Although I have it in my head to knit all immediate family members a scarf for Christmas, I sincerely hope that Needle’n Thread will continue to be my source for threaded needle inspiration. I agree with Joey – with what she didn’t say explicitly. Practising related skills can cause feedback into your original skill. (that sounds a bit technical, but I only just woke up!) sometimes in ways you’d never think of. this i one area where I have conflicting thoughts. I am formose an embroiderer – it is my first love, but i also dabble in other things, and i am always wanted to learn and try new things. even in embroidering i wonder if it is better to be a jack of all trades and do a bit of this and a bit of that or dedicate myself to one technique and become an ‘expert’ in that area (i dont know how i could narrow it down to one though). at the moment im happiest dabbling in different areas. Hi Mary! Thanks for the wonderful post about my new website, HookedOnNeedles.com! I was not planning to write about the embroidery I have done on Irish Step Dancing dresses quite so soon, but since you’ve introduced my site to all your embroidering friends, I decided to go for it. There will be a few posts about the Step Dancing dresses, with pictures. Any comments would be appreciated! As a Crazy Quilter who loves the encrusted look, I love those tiny crocheted motifs. Take a delicate little basket, tact it down and then fill it with embroidered flowers and leaves. One of my favorites. So, yes. Having knowledge of different skills and methods of needlework is a huge plus in my book. However, I’m in my comfort zone by knowing how to knit, crochet and embroidery. At my age I have no desire to venture out into other areas. I know how to do what I love and I’m going to stick with that. Things like bobbin lace, hardanger, mac…., maq…, oh the knotting of baler twine to make plant hangers for the front porch… I’ll leave these for others. Love this blog as I’ve learned so much here, Mary. Hi Mary, I think it is important for a person to have at least an understanding of other handcrafts and a working knowledge of other textile hobbies can’t be a bad thing. For some of us, it is a necessity to do different kinds of creative endeavors. While doing cross stitch I’m thinking about a quilt top. While working on the quilt top, I’m thinking about what to crochet next (yarn or thread). Or maybe my hubby took some good pictures and I want to paint them on canvas or linen etc etc. I have this drive to keep creating but I get tired of just one thing. Some times they overlap like knowing about shading in my painting helps with shading in my embroidery. Learning about color in quilting again helps with putting the right colors together in embroidery and crocheting.